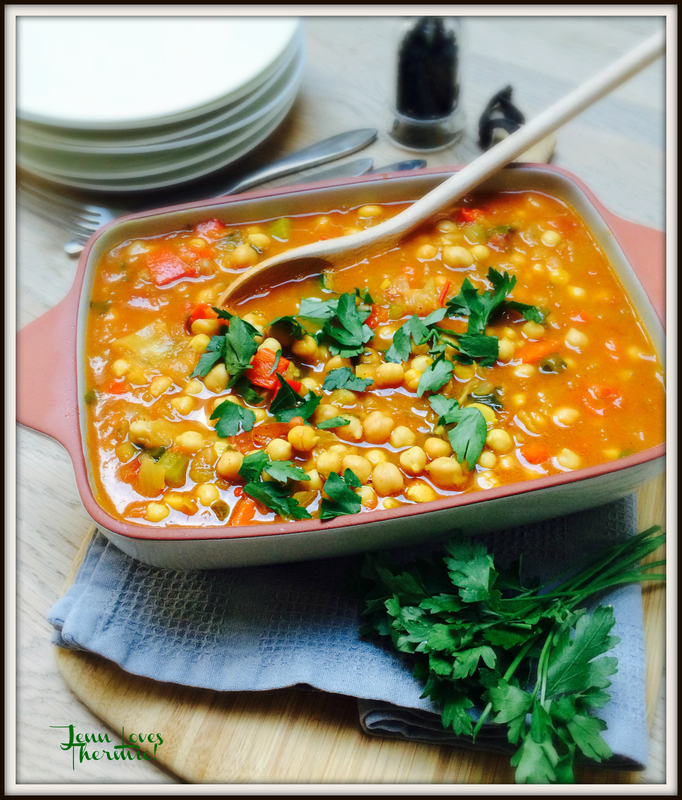 Moroccan Chickpea Stew – Jenn Loves Thermie! I took a sample of this dish to a recent Thermomix cooking class and everyone loved it so I thought I best share the love! I like to serve this with pearl (giant) couscous and a dollop of greek yoghurt although having said that, this is just as great on it’s own. 2 large onions, peeled & halved. 1 red pepper, deseeded, end removed & chopped coarsely. 2 sticks of celery, diced. 1/2 tsp each of – ground ginger, ground cinnamon, ground cumin, ground turmeric. 800g cooked chickpeas (2 x 400g tinned & drained). 400g tin of diced tomatoes. tsp sea salt (himalayan if possible). 250g chicken or vegetable liquid stock (or 250g water with 1 tbsp Fast&Easy vegetable stock paste). Place the red pepper & celery in the TM bowl and chop 2 Sec/Speed 5. Put aside. Place onions into the TM bowl and chop 3 Sec/Speed 5. Add oil, celery, red pepper and spices. Sauté 5 mins/Varoma temp/Reverse/Speed 1. Add the remaining ingredients and cook for 15 mins/100 temp/Reverse/Speed Spoon. Transfer to a thermoserver if you have one and allow to sit for 10-15 mins. This is very happy alongside rice or couscous and a dollop of greek yoghurt. This looks fabulous and may well end up on our table tomorrow!